Not Dogs: Not Dogs Heads to Manchester for the First Time! Not Dogs Heads to Manchester for the First Time! We are very excited to be heading to Manchester’s Charles Street next week to celebrate the student activity across the City with our ‘Meaty Without the Meat’ menu! 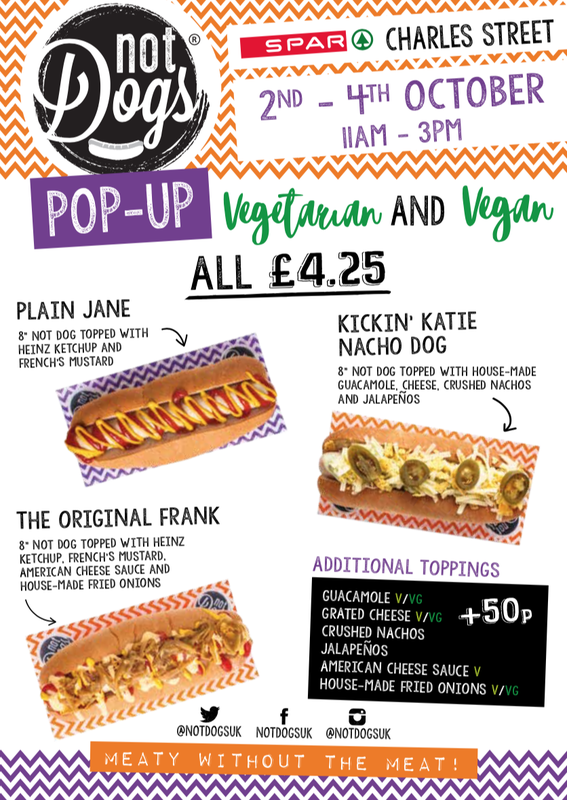 For three days only, the Not Dogs Crew are bringing three of our most popular Not Dogs to Spar on Oxford Road. The menu features Plain Jane, named after Not Dogs co-founder Jane Yates which includes Heinz Ketchup and French’s Mustard, Kickin’ Katie Nacho Dog, named after co-founder Katie McDermott featuring house-made guacamole, cheese, crushed nachos and jalapeños and finally The Original Frank topped with Heinz Ketchup, French’s Mustard, American Cheese Sauce and house-made fried onions. The last time Not Dogs was in Manchester was to film the very scary Dragons’ Den! Manchester’s food scene is full of amazing, inspiring brands and it’s somewhere we’d love to have a permanent Not Dogs presence in. Hopefully our little pop-up is the start of something great. 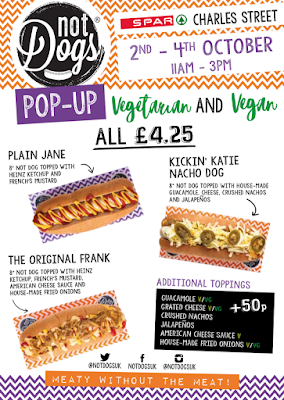 Not Dogs will be popping-up at Spar Charles Street, Manchester from Tuesday 2nd to Thursday 4th October opening 11am until 3pm. See you there!